← Bible Contradictions #39: Is it ok to kill? 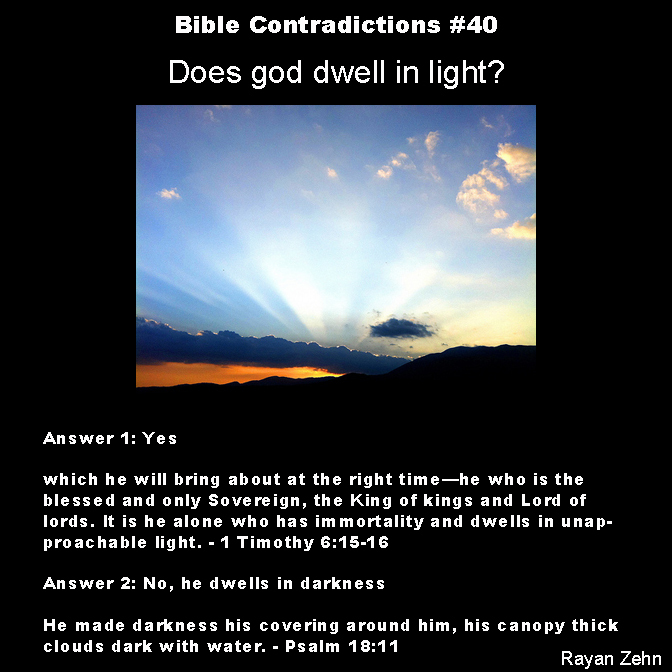 Bible Contradictions #40: Does god dwell in light? We have this image of god in our mind, perched up in heaven on a golden throne, suspended by white fluffy clouds, light of unknown origins haloing his head. We often associate god with light. Indeed, the bible teaches us that god “dwells in unapproachable light.” But what if I told you this was the only time in the bible that it mentions god dwelling in light? And what if I told you there were far more verses claiming that god actually dwells in darkness? Well, here you go. First, in 1 Kings 8:12 Solomon claims that god dwells in darkness. This verse is copied verbatim in 2 Chronicles 6:1. Next, Psalm 18:11 shows us how god made it dark. Apparently he used clouds and water. Couldn’t he have just turned off the light? Anyway. Finally, Psalm 97:2 tells us that god is surrounded by darkness and clouds. In other words (if you’re one of those people who use the bible as evidence to prove the bible), we have more reason to suspect that god is a brooding god, dwelling in solitary darkness, his hair unkempt as he listens to Joy Division and cuts himself. This entry was posted in Atheism, Bible Contradictions and tagged Atheism, atheist, Bible Contradictions, Christianity, Christians, contradictions in the bible, God, Jesus, Religion, the bible. Bookmark the permalink. 6 Responses to Bible Contradictions #40: Does god dwell in light? Since God is totally free, he can dwell anywhere he likes without having to get approval from his local atheist tyrant. Sure can, silence. And I’ll bet that god doesn’t even need approval from is homophobic/homosexual mass murdering subjects either. Want to see a real ranting tyrannical lip server? I really hate my avatar, and if there is any way in changing it, I’d really appreciate it. Hope it isn’t too much trouble. I think you have to change it on your end. They don’t give me that kind of control. Oh…my mistake then. But I have no control either.